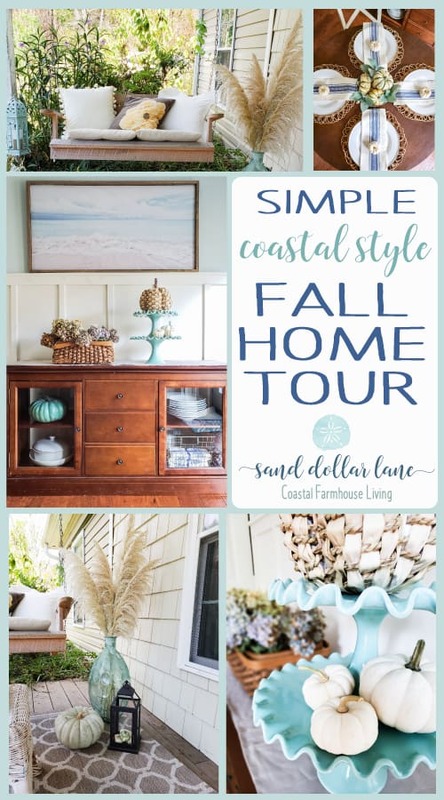 Welcome to our simple coastal style Fall home tour! This year we kept our Fall decorating minimal and easy! 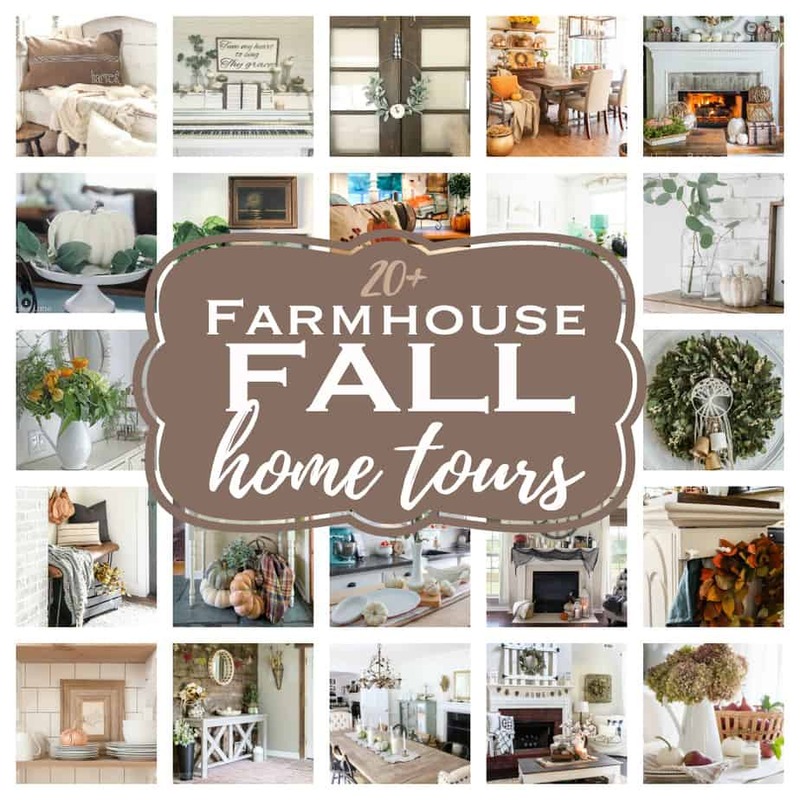 I am so excited to once again be joining 20+ blogging friends on a Farmhouse Fall Tour! If you’re here from County Road 407, welcome! 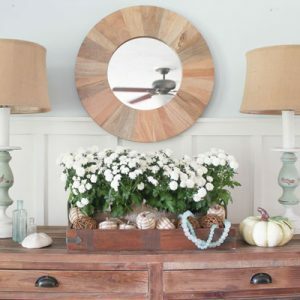 I love Cindy’s fresh farmhouse style! Special thanks to Kendra from Joy In Our Home for organizing this fun tour! 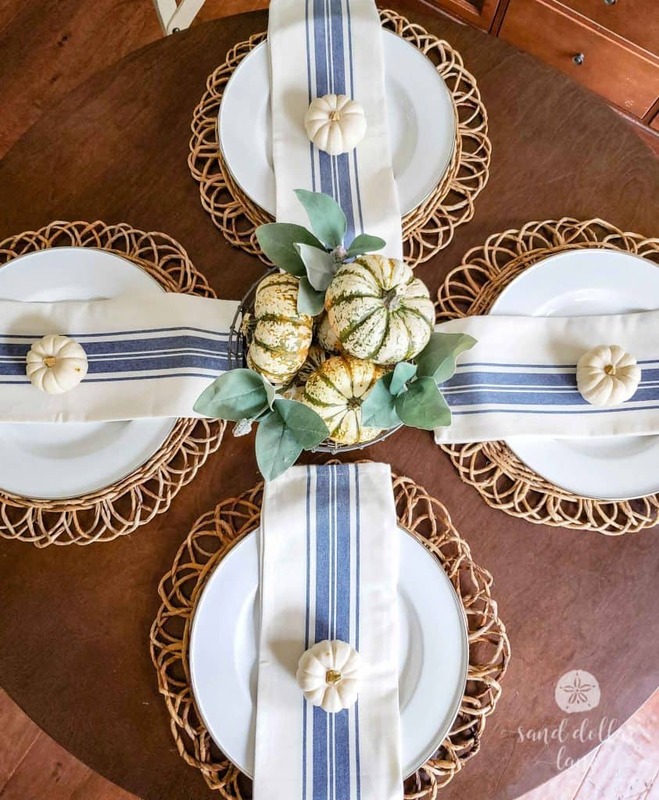 Be sure to check out all the tours at the end of this post for tons of amazing farmhouse fall decorating ideas! You all, I had some big plans for my coastal style Fall decorating. I mean like over the top, pumpkins everywhere, more mums than you could count, kind of Fall decorating. Remember my tour from last Fall? Yeah, like that but more Fall goodness everywhere. Right after I decorated the side porch and started decorating the rest of the house, Florence decided to crash my Fall party. With our area under mandatory evacuation we headed to Tennessee to stay with friends. Thankfully, our home had minimal damage when we were able to return 10 days later. Many people in our community weren’t as fortunate and had major damage and even lost their homes due to flooding. With all the devastation around and so much clean up to be done I really wasn’t in my previous go all out with decorations mood. So, I kept it simple and easy. The dining area is one of my favorite spots to decorate in our house. I love all the light that comes in from our french doors and how cozy this spot is. The basket on the stand was a 50 cent garage sale find! I filled it with dried hydrangeas and some crinkle paper. The aqua cake stand I have had for years; remember it on our open kitchen shelving? I have never actually put a cake on it, but it’s always pretty with seasonal decor on it. 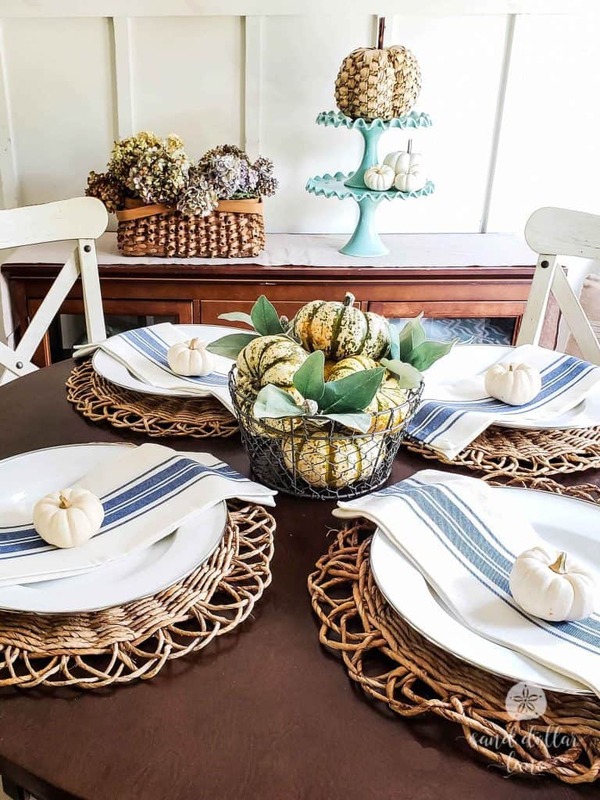 I love mixing textures like these rattan place mats (Pier One) and enamel chargers (Pottery Barn). 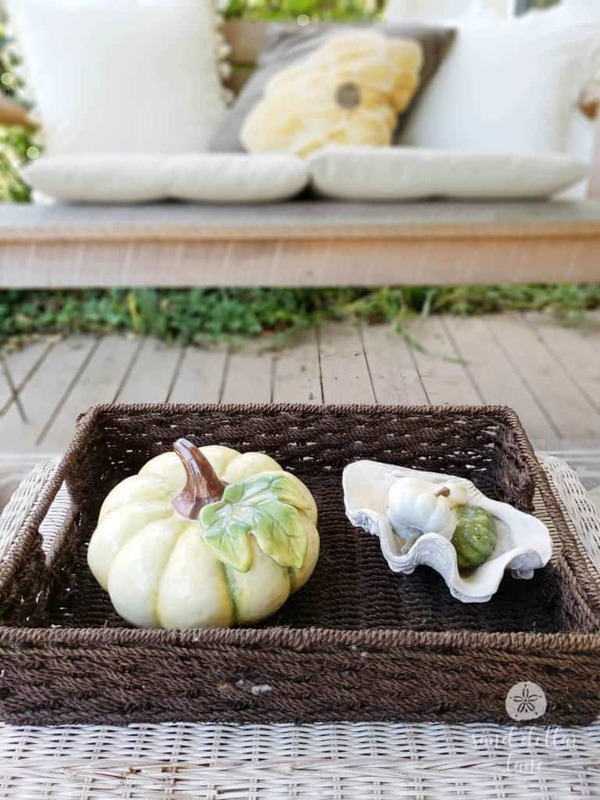 A simple bread basket filled with gourds makes the perfect simple Fall centerpiece. 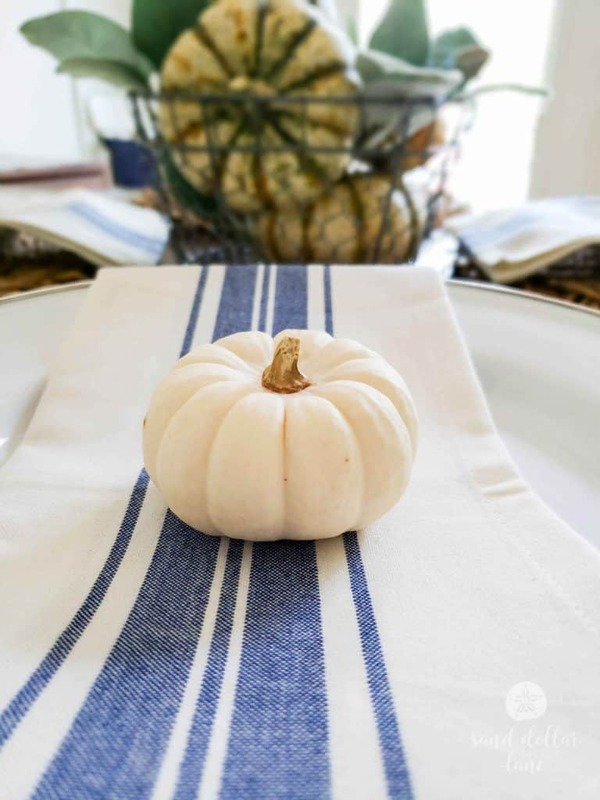 If you are a Sand Dollar Lane Box subscriber you recognize the pretty blue striped napkins from Septembers box! They are also available in our shop here. JC surprised me with this cute porch swing for Christmas. I have coffee here almost every morning. It’s kinda my spot. Does anyone else do that? Have “a spot”? Or is it just me? The little white coffee table was a curbside find! I go back and forth on if I want to paint it or leave it shabby. Today I am liking it shabby. I have been wanting one of these faux clam shells forever. I found this one and a large one at Home Goods a couple months ago and while I loved the larger one and the price wasn’t bad, I couldn’t think of a place in our house that I would put such a large piece. So I opted for the small one. It’s super cute with fake gourds and after Fall I will probably put it on my desk with paper clips or something. Then who even knows where in the house it will end up! I am so glad that I picked our pampas grass before the storm. It was inside but it’s starting to shed so it got moved to the porch. 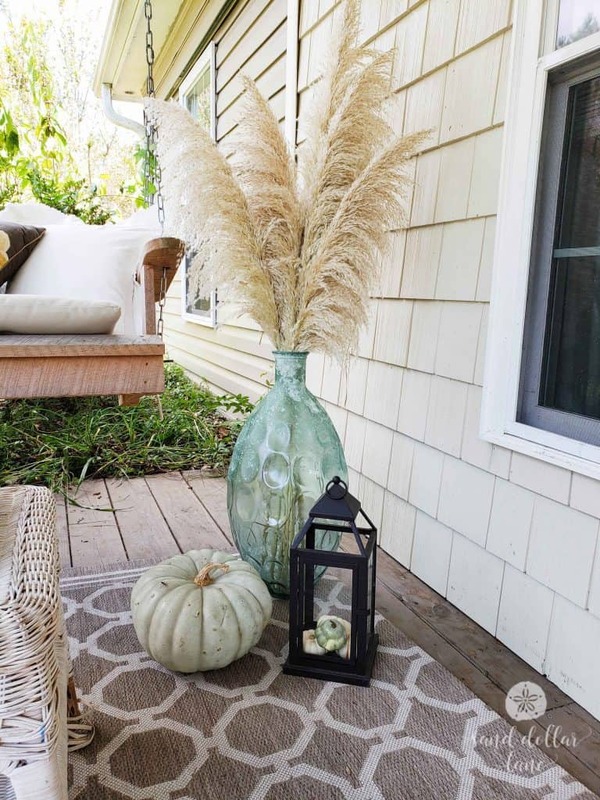 Pampas grass is so coastal’ly Fall to me. 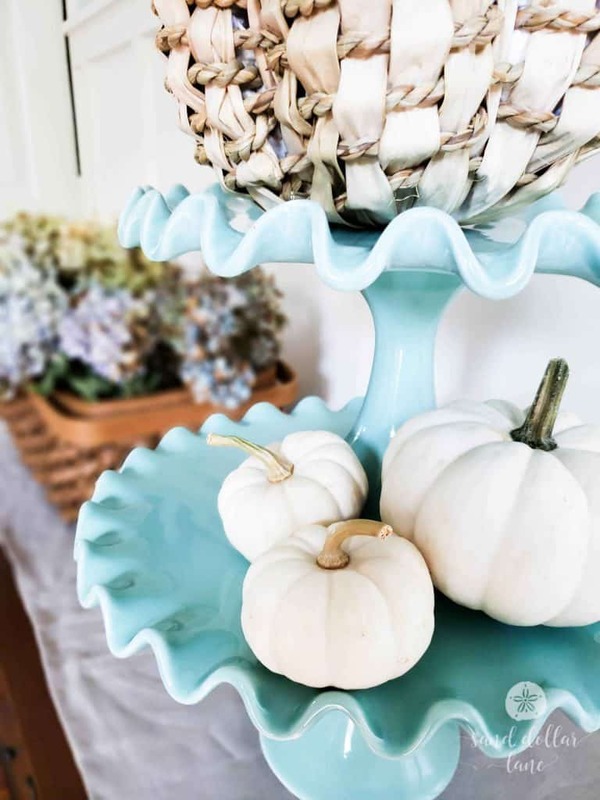 I’ll be sharing the rest of our simple coastal style Fall decorating soon. In the meantime be sure to visit the rest of the Farmhouse Fall Tour! Everything looks so lovely! 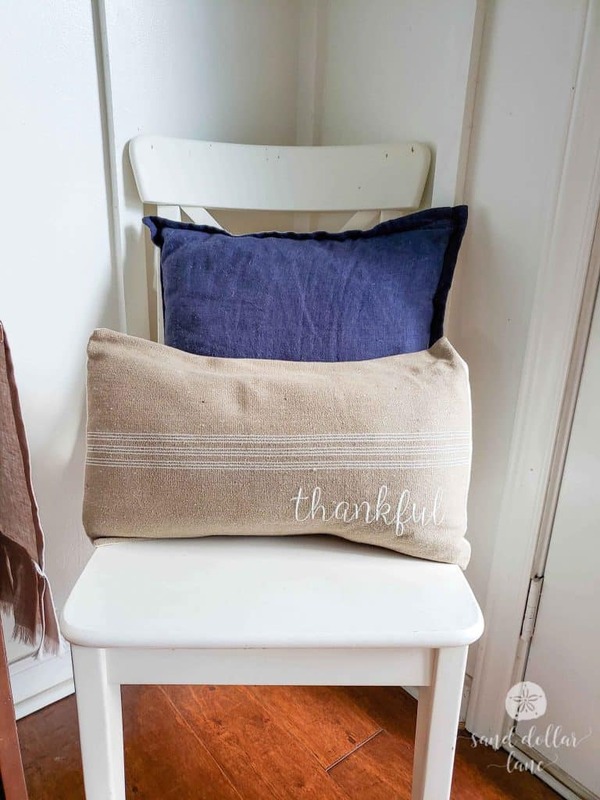 Those beautiful blue napkins are just gorgeous and your front porch looks so cozy and welcoming! What a warm and welcoming home. Love all the bright colors and my oh my I could stay on that porch and never get a thing done. Love it! Happy Fall! Great tour! I love you fall home and your porch looks so cozy! 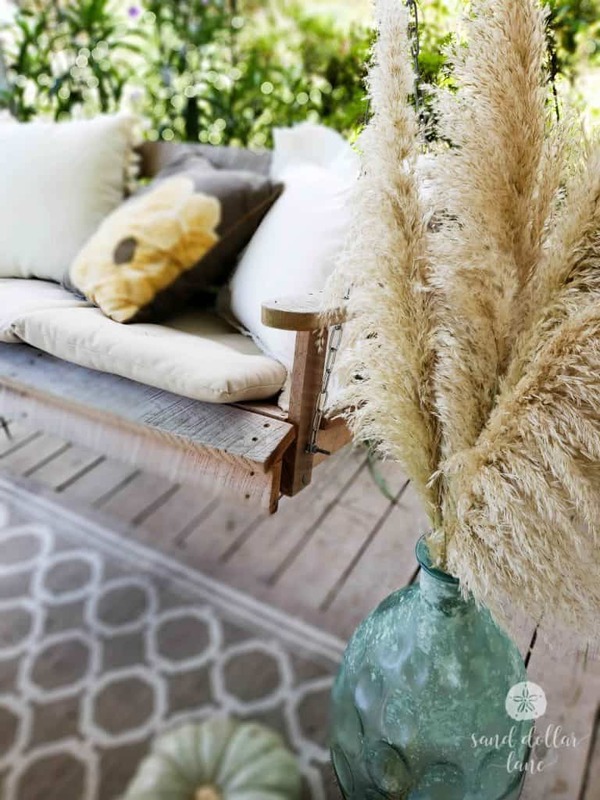 I also love using pampas grass in my decor. So happy you’re back home, Keen! 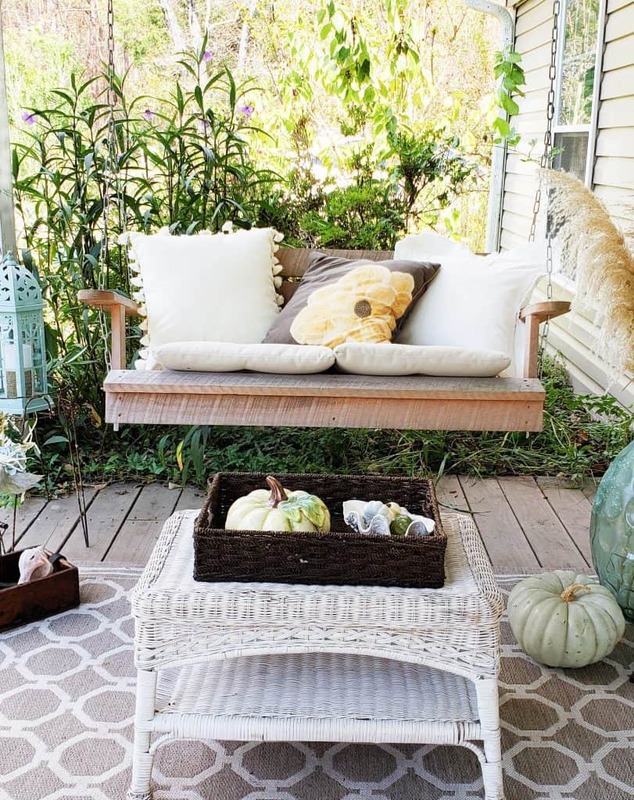 Your home is lovely and especially love your porch! The pumpkins and fall pillows are perfect additions! So glad to be in this tour with you! Everything looks so pretty, I really love that porch swing!! I am so glad y’all didn’t sustain severe damage and were able to return home! 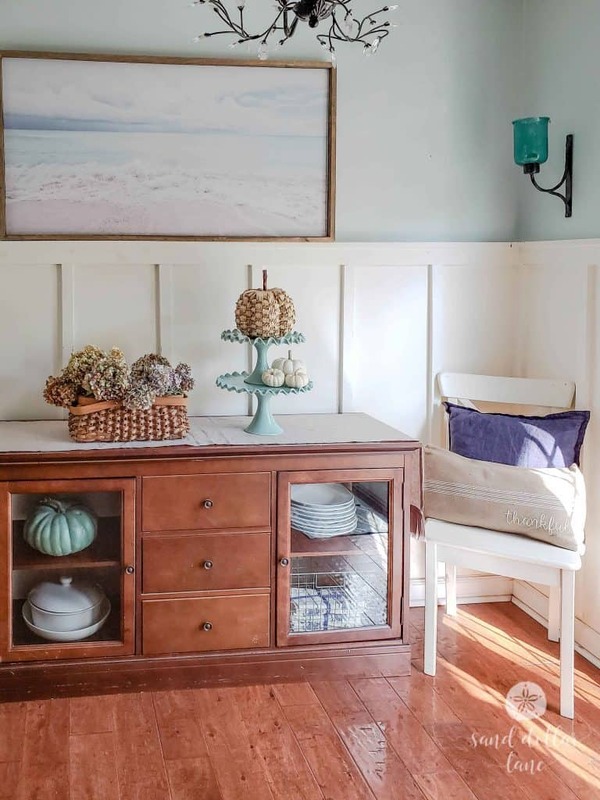 You seamlessly blended coastal and Fall and it looks amazing! I’m so glad your home had minimal damage! I love the tablescape! Your porch looks gorgeous too! Love hopping with you! Everything is so beautiful! I love the simple look this year. I am sorry to hear you were under evacuation. Glad to hear you are alright and that no major damage happened. I love your tour! It is so pretty. 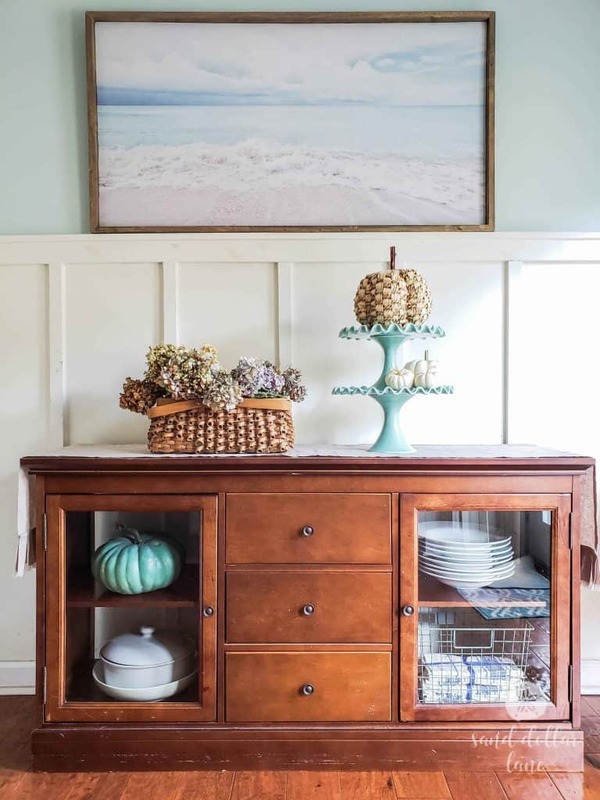 It definitely has a coastal vibe, but reads fall all the way! Thank you for sharing with us! Love this! I love the simplicity of it! Gorgeous! !